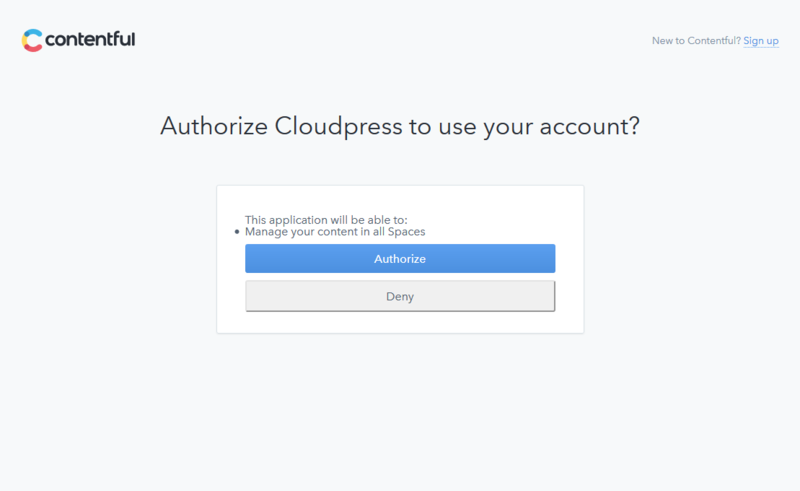 To link your Contentful account to Cloudpress, you will need to authorize Cloudpress to have access to your account. This document will walk you through the process of linking your account. 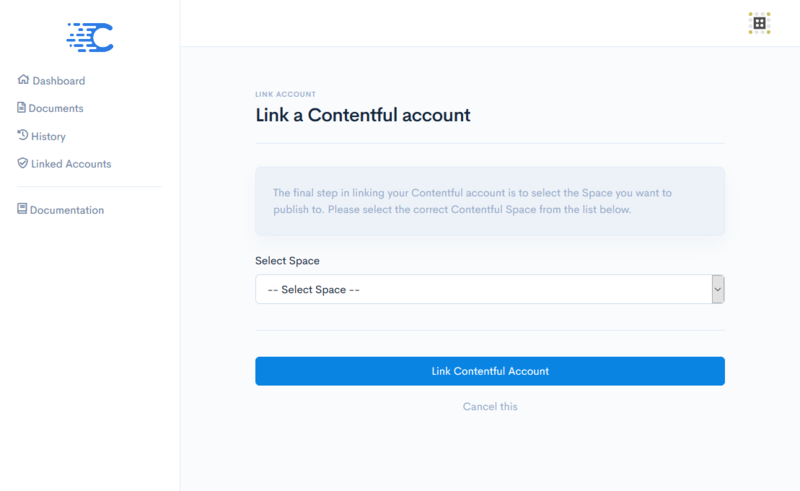 Before you link your Contentful account, you will need to create a space and a content type for the content you wish to publish, if you have not already done so. One short text field that is configured as the Entry title. When publishing documents from Google Docs, Cloudpress set the value of this field to the title of the Google Doc. One long text field. This field will be used to store the content for the entry, in other words, the content which is extracted from the Google Doc. At this point in time, Cloudpress does not support Contentful’s rich text fields yet. You can see an example documentation content type defined in Contentful in the screenshot below. In this case, the field named Title will be used as the title of the document, and the Content field will be used for the content of the document. For more information, refer to the Contentful data model documentation. 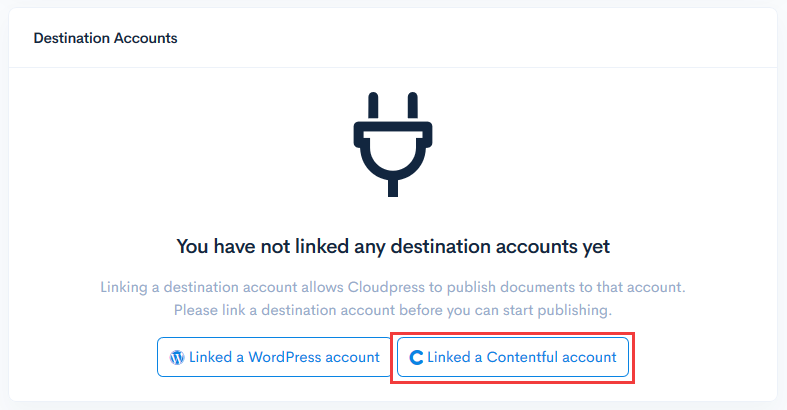 You can link your Contentful account by going to the Destination Accounts section of the Linked Accounts page in the Cloudpress Dashboard. Depending on whether or not you have previously linked other destination accounts, you will either see an empty account list or a list of accounts that you have already linked. This will take you to a page that will give you a brief overview of the process involved in linking your Contentful account. If you are happy to proceed, you can click on the Authorize Cloudpress to access your Contentful account button. This will take you to the Contentful website where you will need to log in with your Contentful if you are not already logged in. 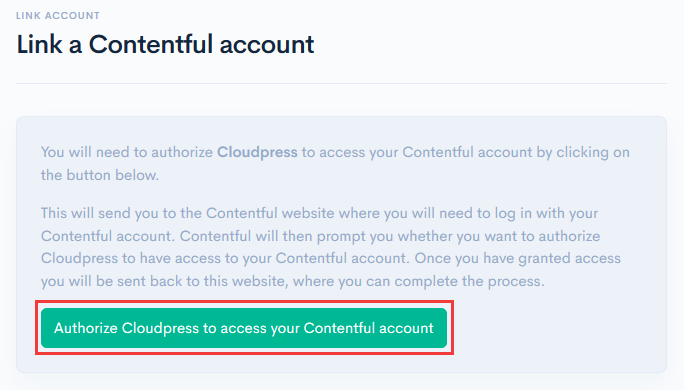 Contentful will then prompt you whether you want to allow Cloudpress access to your Contentful account. You can click on the Authorize button to proceed. You will be sent back to the Cloudpress website where you can complete the process of linking your Contentful account. First, you will be prompted to select the Contentful Space you want to connect. Select the correct space from the list and then click on the Link Contentful account button. For the Body Field, select a field defined on the content type that will contain the actual content (or body) of the document. This field must be defined in Contentful as a Long Text field. The locale is the locale you want to use when publishing content to Contentful. If none is specified, the default locale for the space will be used. The Publish status indicates whether documents must be uploaded to Contentful as draft content, or whether it should be published. 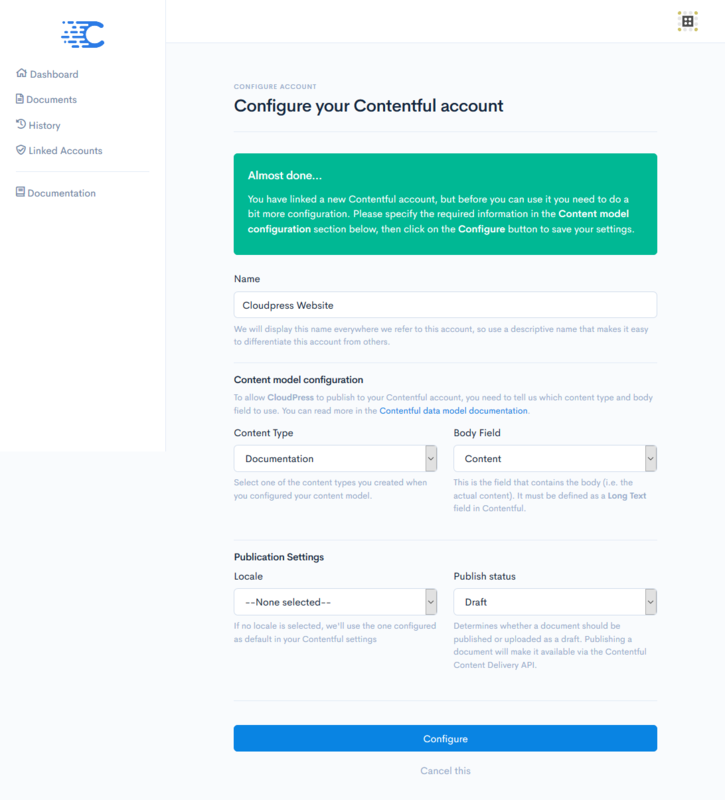 Once you have completed the information, you can click the Configure button to complete the configuration of your Contentful account.